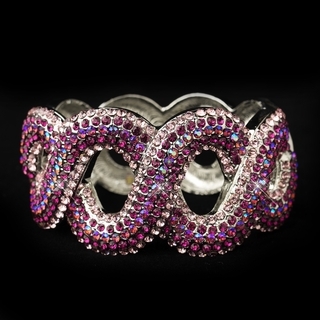 Add an unforgettable sparkle of fuchsia and iridescent color to your wrist with this unique bangle-style bracelet. This silver-plated piece of arm candy features an interwoven wave-like pattern that is adorned with gemstones. It would be the perfect accessory for a homecoming, prom, wedding, birthday party, or other special event!